The usage of Internet Explorer has always been in the lead because it is installed in every Windows operating system by default and the shortcut icon is always placed somewhere that is visible such as pinned to taskbar in Windows 7 that encourages basic computer users to use Internet Explorer. 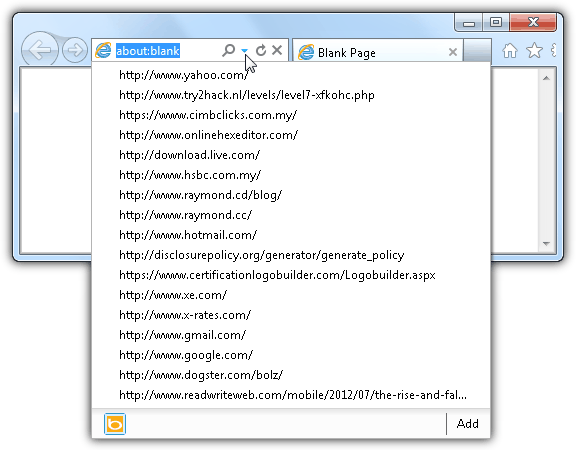 Multiple people using Internet Explorer on the same computer that is logged on with the same user account will have some privacy issues because the last 25 visited URLs can be easily viewed by anyone on the computer by clicking on the drop down icon at the address bar or simply pressing the up/down arrow key from the keyboard. You can easily clear the history which is the list of websites that you’ve visited by pressing Ctrl+Shift+Del but that would only trigger the attention of someone monitoring the computer. Although you can selectively delete the visited URLs from the address bar but that might also trigger the attention because Internet Explorer only keeps the latest 25 URLs on the address bar. Deleting a few URLs from the history reduces the number of saved history. What we can show you is the possibility of editing, changing or modifying the addresses from the history which will cover your tracks pretty well. The easiest way to do it is by using a program that is made to do that. 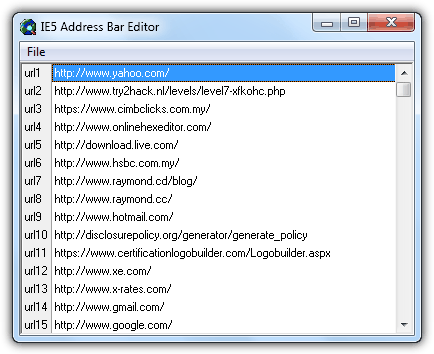 IE Address Bar Editor is a free and portable tool that allows you to modify the history on Internet Explorer. Simply run the program and click the Read URLs button which will load all the saved URLs in history. You can edit the URL by selecting on it to highlight the item and click the Edit Selected URL button. Click the OK button to close Edit Address window and remember to click the Save URLs button to save the changes that you’ve made. You can also manipulate the addresses by moving them up or down and deleting selected or all URLs from the list. IE Address Bar Editor was released 4 years ago but it works perfectly on Internet Explorer 9 when ran as Administrator in Windows 7. 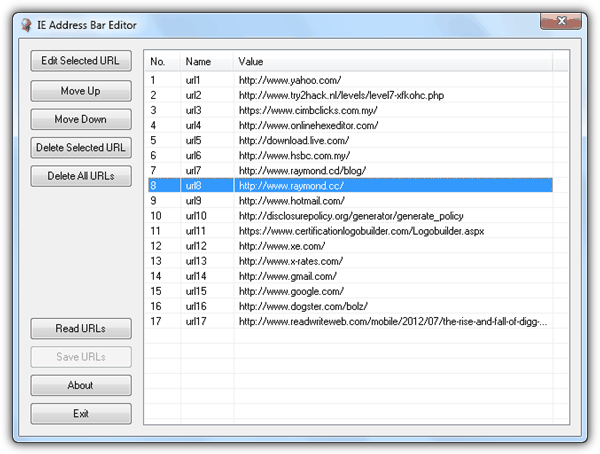 IE5 Address Bar Editor is similar to the above tool except it is simpler as it only allows you to edit the URLs. Simply run the program, double click on the entry that you want to change and type your preferred URL. You will also need to save the changes to take effect by either clicking on the File from the menubar and select Save Registry Settings or press Ctrl+S. This program was released on year 2000 and amazingly it works on IE9 in Windows 7 when ran under administrator or UAC disabled. You can see that Microsoft has been using the same location to store the Internet Explorer history. EditURLs is also another old program that works but requires installation. Running the program will list all history from Internet Explorer. To delete an item, select the URL to highlight and click the Edit Selected URL button. You will need to click the Save and Exit button to save the changes. You can also delete selected or all URLs from the list. A special feature that is not found on the other tools is the ability to backup the “typed URLs” so that you can maintain your personal set of history even when it has changed. 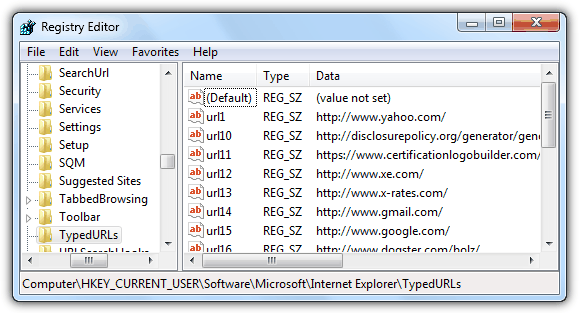 At the right pane, you will see a maximum of 25 registry values from url1 to url25. You can change the value data by double clicking on a registry item and type your URL that you want. Please take note that the 4 methods mentioned above only edits the last typed URLs but not the history. If you’ve previously visited the webpage before, you’ll have to delete the URL from the history or else it will still show up in the address bar.